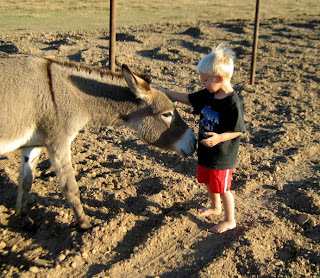 The Cowpokes in these parts are really good Wild Donkey Trainers. They can tame even the wildest of beasts. 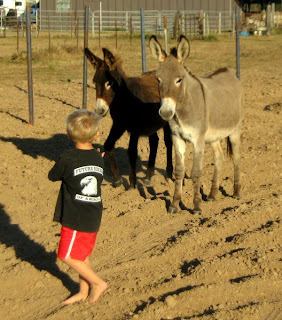 You can not even tell that two weeks ago neither of those donkeys would let you touch them. 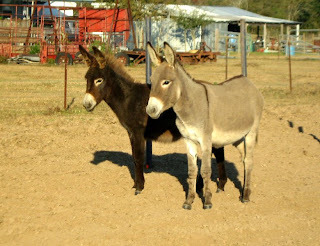 Now look at those little burros. Big Cowpoke can give Stormy hugs. 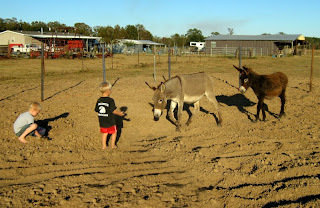 (Note, I did not name the Donkeys). Little Cowpoke can give Misty hugs. 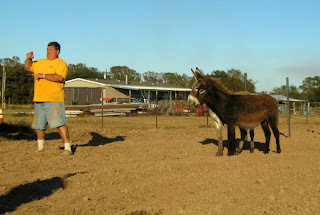 They can even get the donkeys to put their heads down and follow them. Stormy and Misty really just wanted some scratching. Little Cowpoke had to do some convincing, to get them to follow. "Come on Donkeys! Follow me!!" Misty turns to Stormy and says, "Do you think we should go? Those two legged animals are weird." 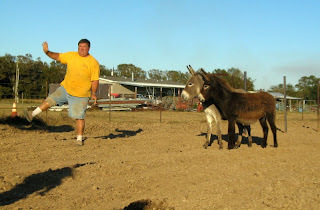 "Yeah good idea Stormy, we will just stay back a bit and watch those two legged animals. They are sure different." "What is he doing?" 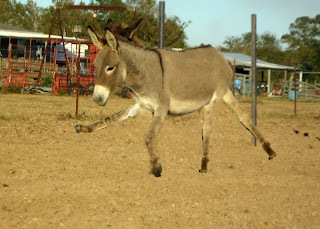 "How does he get his hoof to go up that high? Can you do that Misty?" "Umf....Nope, I can't get my leg up that high! I am telling you those two legged animals are very weird and bendy." "Whoa, whoa!! What is this. It looks like the Hokey Pokey. 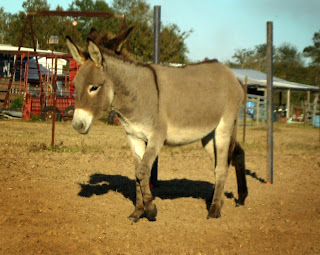 You put your right hoof in you put your back hoof in and you shake it all around....." "You do the Donkey Pokey and you turn yourself around........." "Few....I am tired. 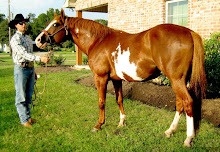 Lets go back to the barn and wait for some food. I am not sure I can keep up with those two legs." Too funny ! Let's hokey pokey ! Yeah, a little too much spare time! :) LOL! You're too funny! Andrea, I have to agree with your sis'... Rofl! Have you been hitting the top shelf bottles in the pantry? 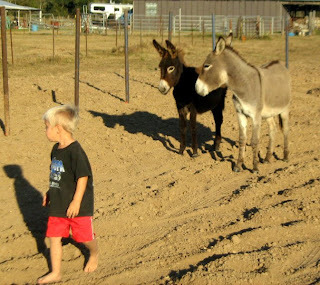 Now seriously, I'm impressed we have 5 donkeys and I can't get one of em' to look at me let alone be gentle enough to handle. How in the heck did y'all do it? Oh holy crap...I had to do a double take at that picture...that is some funny stuff my dear!!!ROFL!!! Oh all right...I know, I am easily amused. But really, it's the little things! 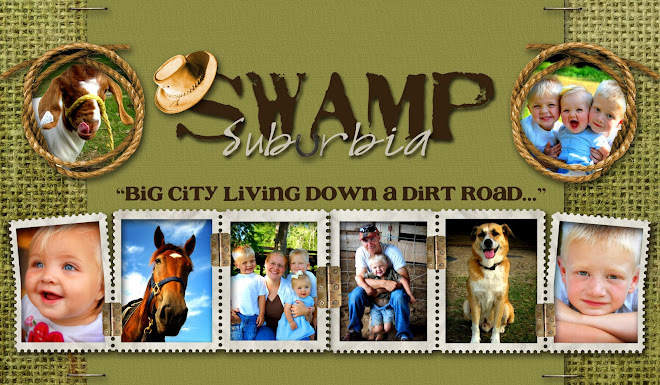 Look at all the cuteness going on in this post! It's almost too much! 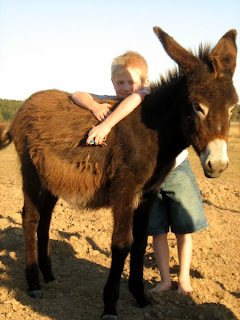 Love the donks! and of course the little cowpokes! 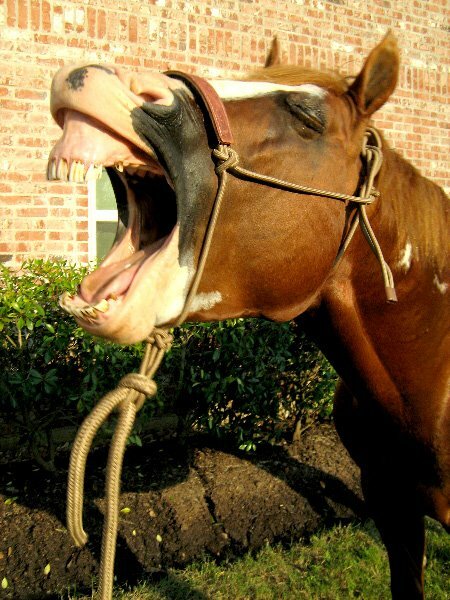 See these are the ones that say "eee haw eee haw"! I know my animal sounds! Your comment about saying no to that lady if she needs help cracked me up! Sheldon came out of that meeting on Sunday and told me the exact same thing! He said DON'T ANSWER THE PHONE THIS WEEK! Wait for the answering machine to pick it up! HAHAHA! 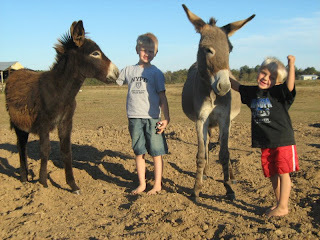 Those boys and donkeys are sure cute together...lol!!! Who knew??? 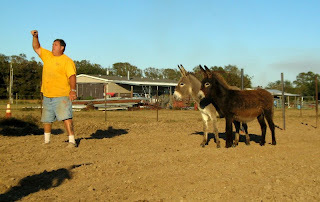 They're like the Donkey Whisperers. 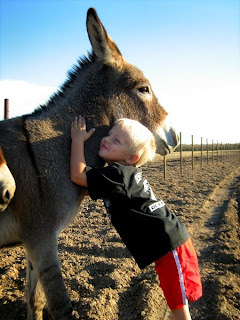 The donkey whisperer, that is hilarious! Where do you find the time to create all this funny stuff. I know I know, you are the funny one, but still, that was too funny!